If you want some of what’s new for Mazda’s redesigned compact crossover SUV, you can buy any one of the 2017 CX-5 models. If you want all of what’s new, you’ll have to get the top-rung Grand Touring with the Premium Package option. A power liftgate is newly available on the CX-5 for 2017, and it’s standard on the top-line Grand Touring tested. Mazda stirs the CX-5’s pot for ’17 with revised styling inside and out, plus a broadening of standard equipment, especially in the base Sport model. New features include a heated steering wheel and rear seats, a reclining rear seat back, power liftgate, windshield-wiper deicer, adaptive cruise control that now can bring the vehicle to a stop, and head-up display. The power liftgate, rear-seat recliner, and improved cruise control are all built in to the Grand Touring but the other items require ponying up for the Premium Package, an $1830 group that also includes a memory driver’s seat and 6-way power front passenger seat. Consumer Guide® drove a Grand Touring with Mazda’s i-ACTIV all-wheel drive, the Premium Package, and a trio of individual options, all of which added up to a delivered price of $34,380. No matter what you pay for a CX-5 (prices start at $24,985 for a front-drive Sport), you get a lively and useful little SUV. It may prove difficult to keep clean, but the black-and-white two-tone interior helps give the Grand Touring a decidedly upscale look. Mazda has settled on a single powerteam for 2017, a 2.5-liter 4-cylinder engine and 6-speed automatic transmission. The engine picks up three horsepower this year, up to 187 peaking at 6000 rpm. It is responsive around town and capable on the highway, and toggling the “Sport” switch on the console provides slightly sharper throttle response and crisper shifting. The AWD CX-5 is EPA-rated at 23 mpg in the city, 29 mpg on the highway, and 26 combined. This driver would have liked to have at least hit that city number. 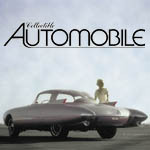 His 248–mile test run, which included 70 percent city-style driving, averaged 22.9 mpg. Ride and handling were both extremely likable in the test vehicle, which came with standard-equipment 19-inch wheels and low-profile tires. Mazda claims its “G-Vectoring Control” system adjusts power delivery in cornering to better manage the vehicle’s weight shifts and improve the driver’s sense of control. The CX-5 certainly doesn’t feel top-heavy, and it is easy to use in confined spaces like parking lots. If there’s a weakness in the CX-5, it’s that the infotainment system is controlled by a console knob and dashtop screen, the latter of which is only touch sensitive when the vehicle isn’t moving. Though outward appearances have been massaged to draw a resemblance to the midsize CX-9 crossover and the interior has undergone an updating, the new CX-5 isn’t fundamentally different from the previous generation. The instrument panel and console have new looks but contain what was there in the past. The 7-inch screen (which is touch sensitive only when the vehicle is standing still) that was formerly built into the dash now rises above it, but the menu of systems and settings that can be summoned on the screen is the same, right down to the graphics—and the Commander control dial on the console that manages the whole affair at the risk of some loss of attention to the road. Thankfully, controls for the dual-zone automatic climate system remain separate and more direct to use. The Bose audio system sheds a CD player but gains a speaker—there now are 10 of them. Satellite radio is standard in the Grand Touring. 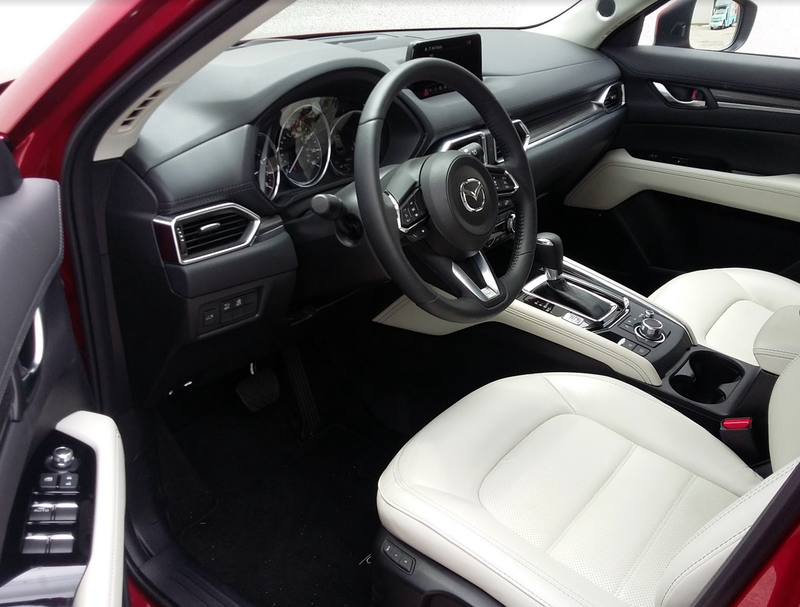 Seats are comfortable and supportive, and in the Grand Touring they’re upholstered in leather and heated in front. Other top-model standard features are power lumbar adjustment for the driver’s seat and a leather-wrapped steering wheel and shifter knob. Soft-touch surfaces are amply distributed on the dash, door panels, and console sides, and there are woodgrain highlights. Passengers enjoy plenty of legroom up front, and a fair amount in back for two adults or three children. Headroom is excellent all around. Roof pillars are somewhat thick, diminishing visibility. Occupants are served by door pockets, a good-sized glove box, two open cup holders in the console, and a covered console box with a 12-volt power point and media-device inputs within. Rear passengers get small door pockets, pouches on the backs of the front seats, and two cup holders in the center armrest. Control switches for the optional rear seat heaters are in the armrest as well. No complaints with available cargo room, as there’s plenty of space, and the rear seat backs fold level with the cargo floor. The flat cargo floor loads at bumper height. At the sides are a power point and levers to remotely release the 40/20/40 rear seats and center armrest. When the rear seats are folded, they rest nearly flat. 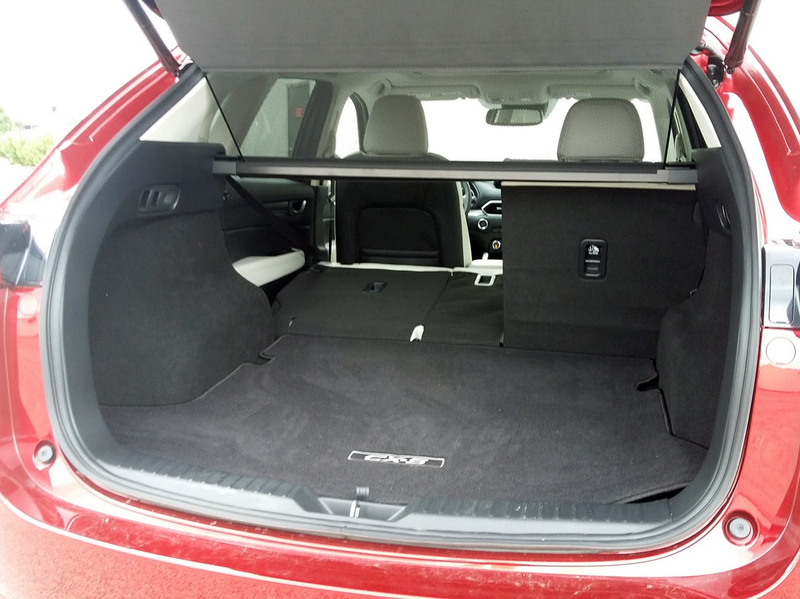 Cargo space is good with the rear seats up, and great with them down. Depending on what you can or can’t live without, the CX-5 Grand Touring also comes with heated exterior mirrors, LED taillights and fog lights, adaptive headlights, a moonroof, navigation, rearview camera, blind-spot monitoring, rear cross-traffic alert, lane-departure warning, lane-keeping assist, and forward-collision mitigation. Going cheaper for the Sport or the midlevel Touring doesn’t necessarily mean giving up all of those things, some of which can be had in option groups. 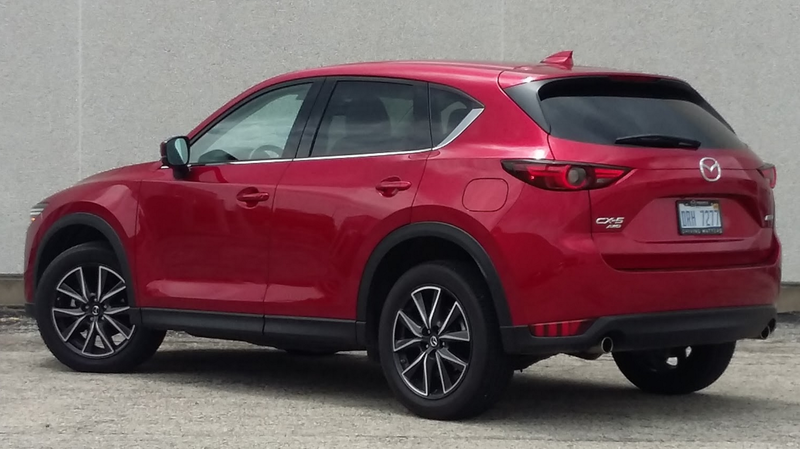 No matter how a CX-5 comes, there’s enough that’s new to make this Mazda a must-see for shoppers in the market for a compact crossover. While I’ve not been a big fan of Mazda’s current infotainment-control layout — particularly the inability to use the touchscreen while driving — it seemed as though entering a navigation destination on our 2017 tester was far easier than it had been on previous Mazdas. I also got better fuel economy than did “lead foot” John, as I managed 25.8 mpg on a highway trip that included far too many logjammed bumper-to-bumper miles. During that time, however, I noticed that the speed-limit sign that showed up in the head-up display often didn’t match what was posted on the road, an unexpected flaw in an otherwise really appreciated — and rare for the class — feature. 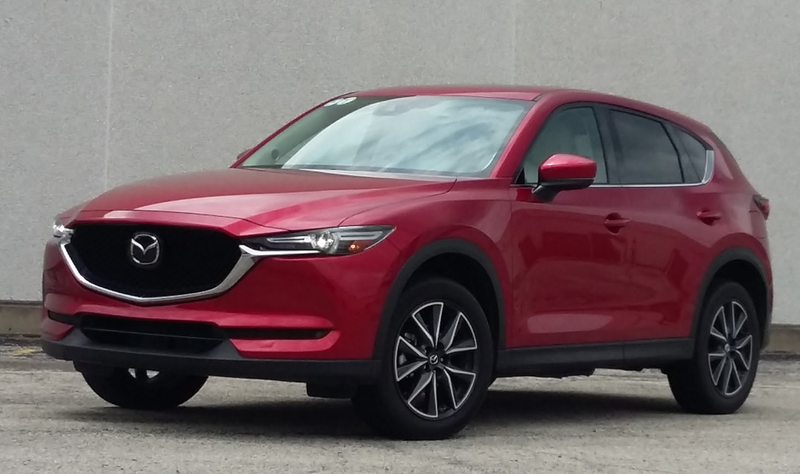 Despite a few blemishes, the CX-5 remains one of the top vehicles in a class that is now the most popular in all of autodom, and though the Mazda brand may not be among the “big boys” in the market, this is a vehicle that should be considered by anyone shopping the compact-crossover segment. Mazda’s sporty CX-5 has long been one of our favorite compact crossovers, and its redesign for 2017 — which adds several newly available features — has only made it better. Written by: The Daily Drive staff on June 29, 2017.on June 30, 2017.